For people with ADHD, the responsibilities of adulthood -- bills, jobs, and children, to name a few -- can make problems with organization more obvious and more problematic than in childhood. 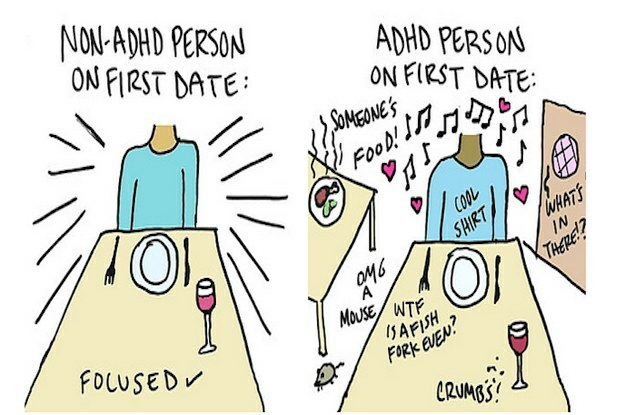 Adults with ADHD are often hypercritical of themselves, which can lead to a poor self-image. This is due in part to their inability to concentrate, as well as other symptoms that may cause problems in school, work, or relationships. Adults with ADHD may view these difficulties as personal failures or underachievement, which can cause them to see themselves in a negative light. Although this may sound surprising given that restlessness is also a symptom, fatigue is a problem for many adults with ADHD. There could be several reasons for this. It may be due to hyperactivity or sleep problems that can come with ADHD. Or it could be due to the constant effort to focus required by adults with ADHD. Or it could be a side effect of ADHD medications. Whatever the cause, fatigue can make attention difficulties even worse. Impulsivity, lack of motivation, emotional problems, and disorganization can lead a person with ADHD to neglect their health. This can be seen through compulsive poor eating (often overeating, with resultant obesity), neglecting exercise, or forgoing important medication. Anxiety and stress can also have negative impacts on health. Without good health habits, the negative effects of ADHD can make other symptoms worse. Attention-deficit/hyperactivity disorder (ADHD) is among the most common neurobehavioral disorders presenting for treatment in children. It carries a high rate of comorbid psychiatric problems such as oppositional defiant disorder (ODD), conduct disorder, mood and anxiety disorders, and cigarette and substance use disorders. 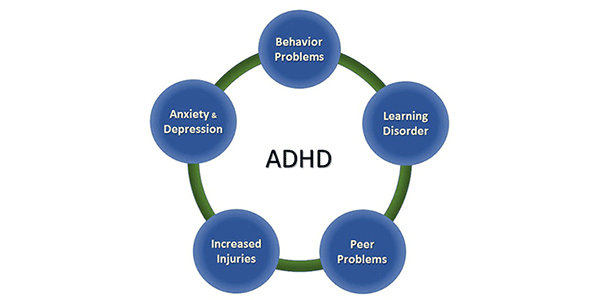 Across the life span, the social and societal costs of untreated ADHD are considerable, including academic and occupational underachievement, delinquency, motor vehicle safety, and difficulties with personal relationships. ADHD affects an estimated 4% to 12% of school-aged children worldwide, with survey and epidemiologically derived data showing that 4 to 5% of college aged students and adults have ADHD. In more recent years, the recognition and diagnosis of ADHD in adults have been increasing although treatment of adults with ADHD continues to lag substantially behind that of children. In contrast to a disproportionate rate of boys diagnosed with ADHD relative to girls in childhood, in adults, an equal number of men and women with ADHD are presenting for diagnosis and treatment. ADHD has been conceptualized as a disorder affecting “frontal” circuitry due to associated deficits in executive cognitive functioning. Structural imaging studies have documented diffuse abnormalities in children and adults with ADHD. ADHD is a complex lifelong neurodevelopmental disorder. 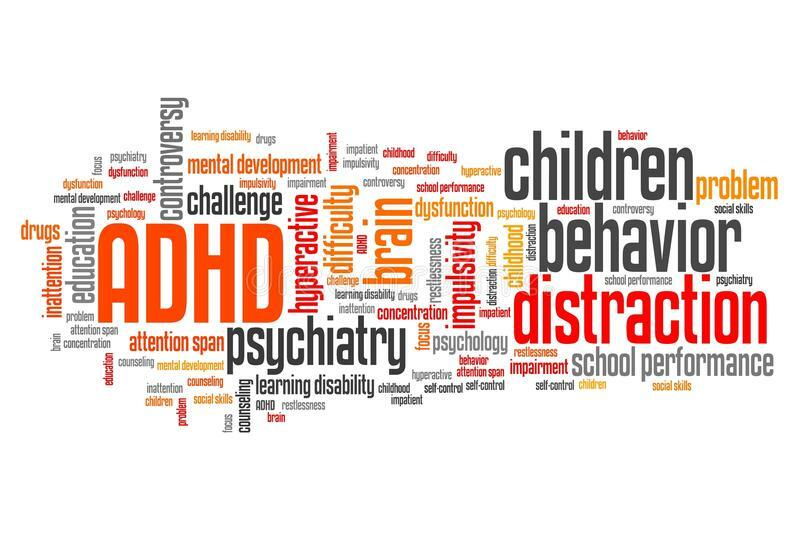 No one knows exactly what causes ADHD, but it is understood to result from chemicals in the brain, known as neurotransmitters, that don’t function properly in the areas of the brain that control activity and attention. 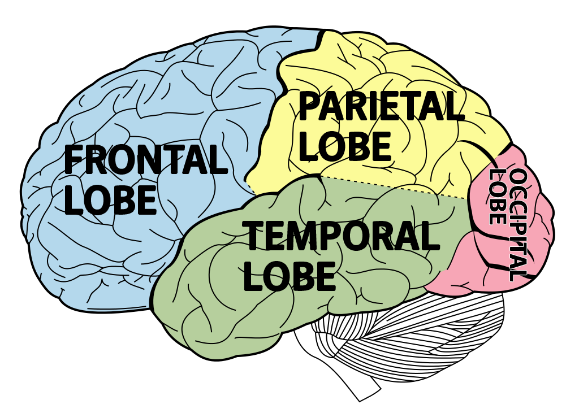 The specific neurotransmitters involved are noradrenaline and dopamine. There’s increasing research to suggest that ADHD is linked to genetics – studies of twins show that it’s 76% inheritable. If an adult has ADHD, their children are at risk of having ADHD. In fact, experts say for any child with ADHD, there’s a 30%-40% chance one parent has ADHD too. At least one third of all adults who’ve had ADHD have children with ADHD. There are also other factors that are thought to increase the risk of ADHD. Some studies show a possible correlation between ADHD and the use of cigarettes, alcohol or other drugs during pregnancy, as well as exposure to toxins (lead, for example) during pregnancy. Environmental factors can also influence the risk of having ADHD, such as birth complications, premature birth, low birth weight and brain injuries. Standard treatments for ADHD in adults typically involve medication, education, training and psychological counseling. A combination of these is often the most effective treatment. These treatments can relieve many symptoms of ADHD, but they don't cure it. It may take some time to determine what works best for you. Other medications used to treat ADHD include the nonstimulant atomoxetine (Strattera) and certain antidepressants such as bupropion (Wellbutrin, others). Atomoxetine and antidepressants work slower than stimulants do, but these may be good options if you can't take stimulants because of health problems or a history of substance abuse or if stimulants cause severe side effects. The right medication and the right dose vary among individuals, so it may take time to find out what's right for you. Tell your doctor about any side effects. If you're like many adults with ADHD, you may be unpredictable and forget appointments, miss deadlines, and make impulsive or irrational decisions. These behaviors can strain the patience of the most forgiving co-worker, friend or partner. Make a list of tasks to accomplish each day. Prioritize the items. Make sure you're not trying to do too much. Break down tasks into smaller, more manageable steps. Consider using checklists. Use sticky pads to write notes to yourself. Put them on the fridge, on the bathroom mirror, in the car or in other places where you'll see the reminder. Carry a notebook or electronic device with you so that you can note ideas or things you'll need to remember. Follow a routine that's consistent from day to day and keep items, such as your keys and your wallet, in the same place. Ask for help from family members or other loved ones. There's little research to indicate that alternative medicine treatments can reduce ADHD symptoms. However, one recent study indicates that mindfulness meditation may help improve mood and attention in adults who have ADHD, as well as those who don't have ADHD. While treatment can make a big difference with ADHD, taking other steps can help you understand ADHD and learn to manage it. Some resources that may help you are listed below. Ask your health care team for more advice on resources. Support groups. Support groups allow you to meet other people with ADHD so that you can share experiences, information and coping strategies. These groups are available in person in many communities and also online. Social support. Involve your spouse, close relatives and friends in your ADHD treatment. You may feel reluctant to let people know you have ADHD, but letting others know what's going on can help them understand you better and improve your relationships. Co-workers, supervisors and teachers. ADHD can make work and school a challenge. You may feel embarrassed telling your boss or professor that you have ADHD, but most likely they'll be willing to make small accommodations to help you succeed. Ask for what you need to improve your performance, such as more in-depth explanations or more time on certain tasks.